Hope that everyone is doing well! This week was really awesome! We had a good week trying to get our work rolling and find those solid investigators that are willing to act on the message that we are bringing. I really hope that we will be able to do our best to really find those that are willing to choose for themselves to come unto Christ through the invites that God wants them to do. One really cool miracle that I saw this week was when we were park finding. I was having a rough morning and the families hat really looked so sweet turned us down pretty fast when we went up to them, but it was cool to see that the lord puts us through trials for a reason and the last guy we stopped before going back in for lunch was willing to listen to us and was willing to act. He is a very intelligent man and is a sincere guy. He was really happy to meet us and I am so glad that we had he chance to get to know him. He will be coming back to town this Thursday and we will hopefully be able to see him at the end of the week. We really think that he will be keeping to our invites and be willing to search to find the truth. He said intellectually these things don’t sound crazy at all and could be true, but it has to be something done within his heart. Such a great guy though and it strengthens my testimony to know that God gives us little obstacles for our own good and to test us to see if we will continue to do the things he asks when it may be hard or tough. I hope that everyone had a great week and that everything is going well wherever you find yourselves! This week went really well and flew by too! 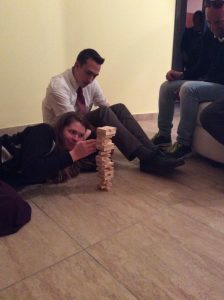 Monday we were able to have a couple of lessons with people and one which was just spontaneous, but ended up being really cool. It is super neat to see how when we have these unexpected opportunities the spirit really guides us to know what we need to share and it’s been really cool to see that this past week. The lesson with our one really sick [awesome] investigator went really well and it is awesome to see that he doesn’t try to find criticism whatsoever in the messages any more, but he just adds things that go right along with the message. It is super cool to see his progress even if it is slow sometimes. I will definitely miss him a ton. Tuesday we were able to have DDM [district meeting] in the morning, which ended at 11:45 and we had to catch a bus at 11:50. We made it to the bus station and bought our tickets, but we ended up missing the bus. We asked one of the workers for the bus line where the next closest stop was so we could go and catch it. He said there wasn’t one and so we took off running after the bus and we ended up making it! Then 2 minutes later there was a stop that we could have easily made it too hahaha. 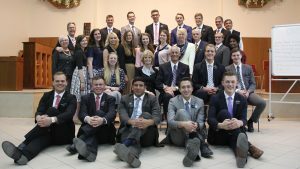 We had a good visit with a less active person and were able to share a talk with him by President Uchtdorf entitled, “You Matter to Him.” It was a great visit and he is such a funny guy. He is really lonely so he really loves the comapany that we give him as well when we are over there. One of the few people that I have met here that really understands sarcasm hahaha. We then almost missed the bus that was supposed to head back into town as well, thank goodness we were blessed with another miracle. We had English groups that night and then we had a meal appointment with a member where we were also able to bring our sick investigator to. 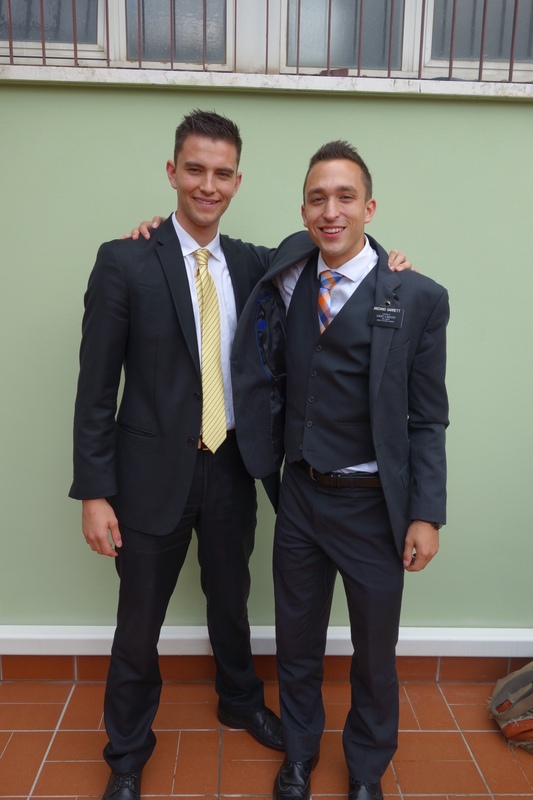 He is so cool and is awesome to see how integrated he already is into the ward and how polite and kind he is. He is so cool. We were able to have a good dinner with a good spiritual thought as well. I hope that everyone is doing well! Sorry I am running short on time once again! Had a lot of people to shoot emails to this week! This week went well and we were able to have a few lessons. We weren’t able to have all that we were planning on having with our investigators, but the ones that we did have went really well. We had such a fun lesson last Monday where one of our investigators brought a friend to the lesson and we did the restoration which went so well!! It was cool to see Anziano Nessen and I just click together. It was a lot of fun to teach and we really hope that we will continue to help these two kids recognize the answer they will receive. They are super cool! We didn’t have a chance to do a lesson with our progressing investigator, but we had almost constant daily contact which was super cool that we were able to keep an eye on him and just keep him going. When he called on Saturday he said to us see you tomorrow morning. That was super cool! We had a good scambio in Crotone this past week and I was able to work with Anzinao Martinez, which went super well! I was able to learn a lot from the amount of faith that he has and how that helps him in all the different parts of the work and his life. He is a convert from Uruguay and he is really cool. He is really funny too and it is so cool to just watch someone get so much awesome work done and then just at the same time be his fun self and joke around with everybody. 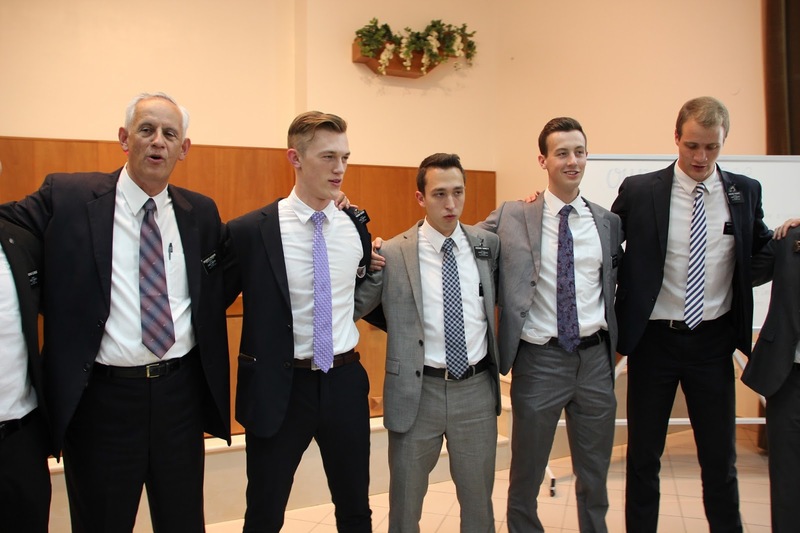 He is a really excellent missionary and it was a pleasure to work with him. 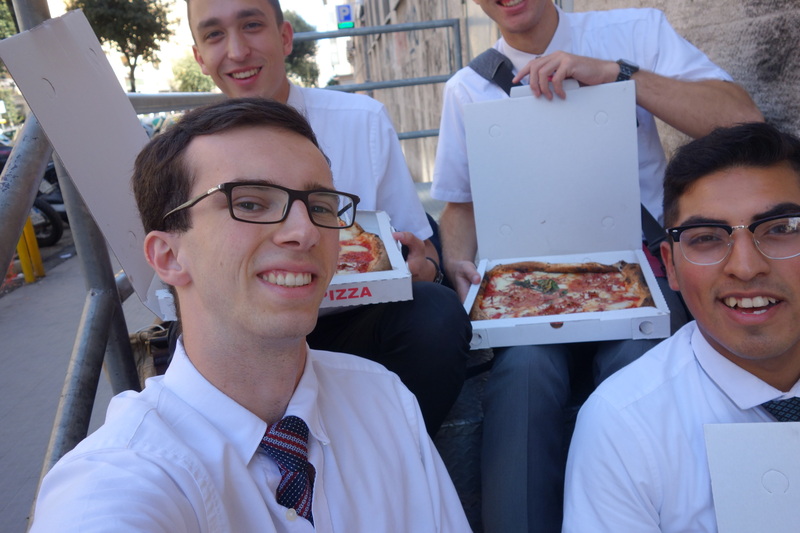 Anziano Nessen was “born” [started his mission] in Crotone so we went and visited this family that he worked with when he was down there about a year ago and they let us in. We stopped the scambio temporarily since they had correlation meeting in the church. 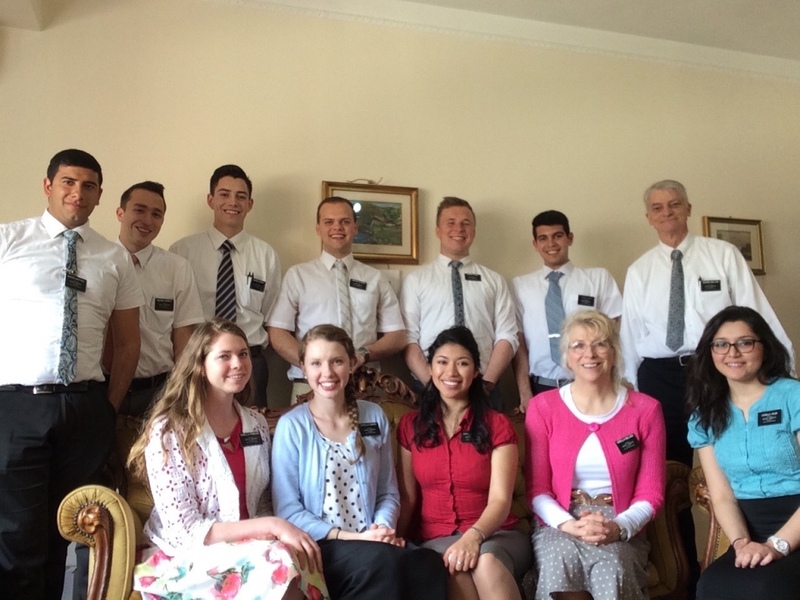 It was super fun to have a lesson with this family regarding the family and the powerful doctrine of eternal families. 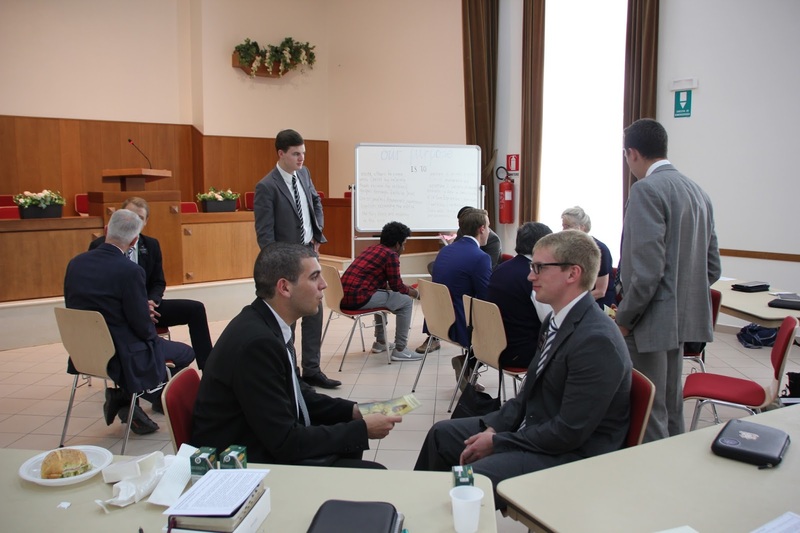 The spirit was so strong as we bore testimony and taught about the importance of family. I know that families can be together forever and it just doesn’t make sense to work all our lives on these relationships and building these beautiful families for it all to end when we die. I know that it is once of the most beautiful and pure doctrines that was resorted through the Prophet Joseph Smith. I know too that is something that has to be done in order and that we can’t just expect it. It needs to be done as an ordinance with Priesthood power that has been restored on the earth again thanks to Heavenly messengers. I am so thankful for that. 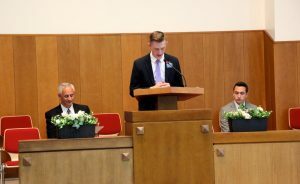 To know I will be able to live with my family forever as I work towards completing those necessary ordinances done in the temples of our God with that proper authority. This week it was really good to see some really cool miracles and we really hope to see a lot this week as well. We have a few days to work hard here in Cosenza then we have to go to Mistretta in Sicilia to pick up the permesso for Anziano Nessen. We look forward to working hard and seeing all that we can get done. Hope you all have a lovely week and I love you all! This week went by super fast and it was super good as well! 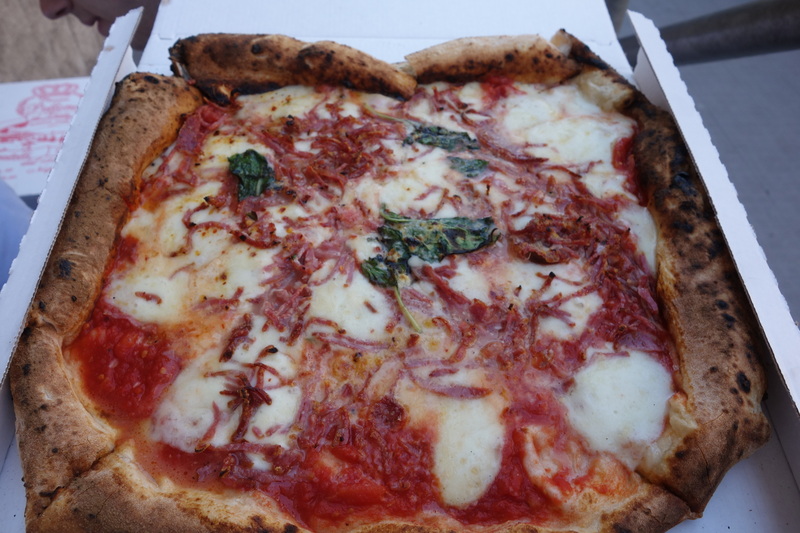 We had a nice scambio on Tuesday with Anziano Pingree and Anziano Pineau. 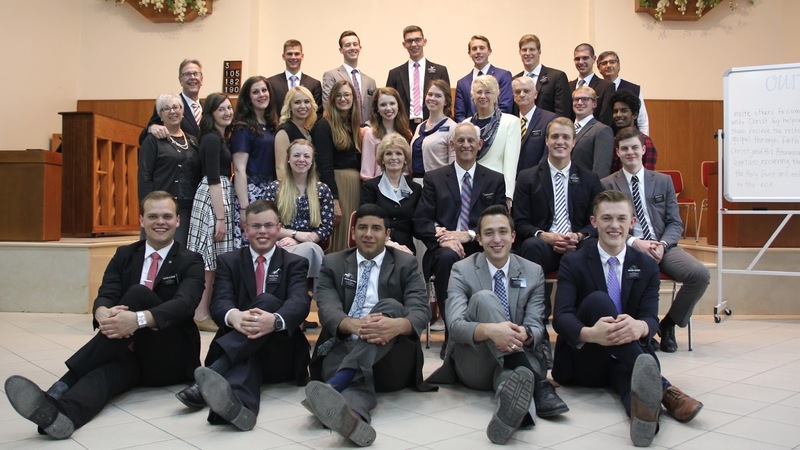 It was a lot of fun and I was able to learn a lot form Anziano Pingree in a lot of different areas of life and missionary work. It was super cool and a really great time well spent together. We had a miracle lesson where the guy was called through a past contact sheet and he said he would be down to meet. We tried to meet in a pizazz with his girlfriend but the dog was going to crazy so we went to a different one and he still went crazy! So we had to give the lesson standing up on a side street on the corner. Not the most ideal place for a lesson but it went really well and they really understood and wanted to learn more and know if it is true. He even offered the prayer at the end and then his girlfriend told him how he needed to fold his arms and close his eyes next time hahaha. It was awesome. We had a really nice zone conference on Tuesday and we were able to hear from the Assistants, President, and Sorella Waddoups. It went super well and it was a Restoration themed training with a big focus on planning. There was really a special spirit there and we were able to really feel the spirit strong as testimonies were born and the spirit witnessed of the truthfulness of those testimonies. We look forward to taking those lessons away and rolling with them as we implement them in our work. We saw a a lot of cool miracles this week and one was with our investigator that hasn’t been making much progress. We went into the lesson knowing we may have to drop him. The lesson went super well and he agreed to read for 10 minutes a day and come to church every day for the next 3 months. Was super sick! I am out of town. Love you all and will talk to you next week! I hope that everyone had a great day and as well as a great Mother’s Day yesterday! Hope you are well! This week went well for us even though some things didn’t go as planned. We were able to see our investigators and it went really well with the lessons that we had with them. We are still looking to help them keep their commitments and realize that is the key for knowing for themselves whether the things that we are telling them are true or not. This was our first full week together and it was a lot of fun. Anziano Nessen is super funny and I am really enjoying working hard with him each day and we are excited to see what we will be able to do together this transfer. We have some great work going on right now and we just want to keep finding more and more and rely on the Lord to help us in all that we are here to do. We had some good lessons this week and I am just so thankful for the Book of Mormon in my life and how it really testifies of so many things. I am thankful for those in ancient times for keeping records and then for Mormon to bring to pass a work that was truly amazing and compile all the needed records to make the Book of Mormon. I am thankful for this scripture when Lehi teaches his son, Joseph, about Joseph of Egypt who prophesied of Joseph Smith and the coming forth of the Book of Mormon. This scripture lays down one of the missions of this wonderful book. 12 Wherefore, the fruit of thy loins shall write; and the fruit of the loins of Judah shall write; and that which shall be written by the fruit of thy loins, and also that which shall be written by the fruit of the loins of Judah, shall grow together, unto the confounding of false doctrines and laying down of contentions, and establishing peace among the fruit of thy loins, and bringing them to the knowledge of their fathers in the latter days, and also to the knowledge of my covenants, saith the Lord. I like how it states that it will confound false doctrine. Then if we go to another scripture in the Book of Mormon where Moroni explains that it is written to help us believe the things in the Bible. It does such an amazing job of showing us that the Book of Mormon is there to support the Bible. I know that is true and the more I study the more I can see this is so true. It will confound false doctrine and helps give us a single interpretation of the gospel of Jesus Christ. Those that truly want to learn more of Christ simply have to pick up the Book of Mormon and read it. That is how you will know that anything the missionaries say is true. We never ask anyone to believe our words and just follow us blindly in what we practice in the Church of Jesus Christ of Latter-day Saints. We ask that they read and ask God for themselves to receive a testimony of truth and light. The Book of Mormon truly blesses our lives more than we can imagine. We are working with some really cool people and they want to know if these things are true and we are enjoying being able to meet with them. 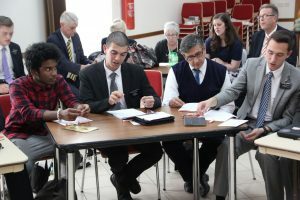 We know that the Lord continues to prepare people to receive the restored gospel of Jesus Christ and we just want to continue to work to find those that are ready to accept our message. The weather has been cold and rainy a lot of the days with the occasional really nice and beautiful day sprinkled in. I hope that will start to become the norm soon. 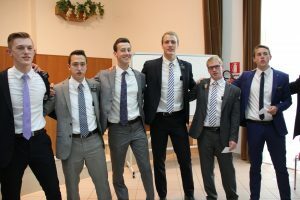 This week we have zone conference so we will be leaving to go to Taranto tomorrow morning after studies and doing a scambio with them there before Wednesday and then continue that afterwards and finish up Wednesday after conference with a zone blitz. 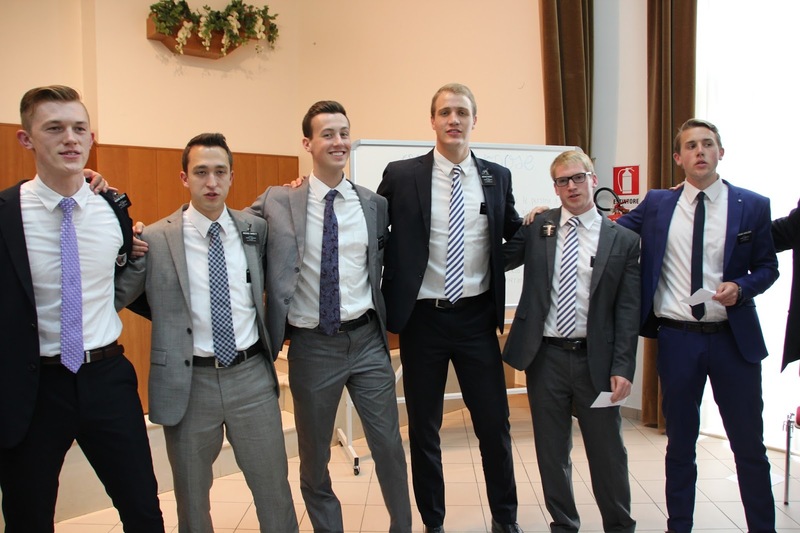 Should be a lot of fun and we look forward to helping all the missionaries in Taranto. 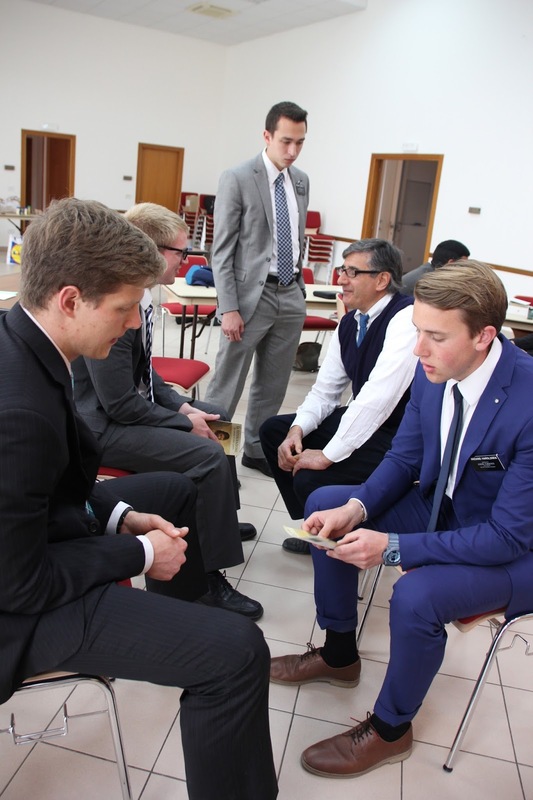 So I was able to talk to my family for the third time on my mission and it went really well! We had a good time talking to each other and catching up on just little things, but overall it just felt that I got to hang out with my family for a while. It was super funny and just time well spent together. Definitely miss them and so many others, but I am very happy to be here and doing this work. Can’t believe how fast the time has gone by here and how many amazing experiences that I have been blessed to be a part of. 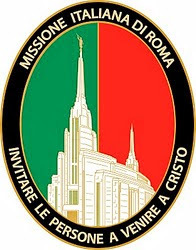 I know that this work is true and it is so worth being away from home for a short 2 years to help those over here in Italy receive blessings beyond imagination through Christ’s restored gospel. It is truly amazing. Yesterday we had a special day for all moms everywhere and I am so thankful for my mom and all that she has done for me. As well as my grandmas and the love they show their kids as well as us grandkids. I am extremely thankful for them and all the love that they give us all that is truly undying and always there. Moms go through so much with us and are there every moment helping us along the way. I love this video that was made for Mother’s Day, but I would like to still invite you all to check it out. It is really special to think of the divine roll that mothers have! It was so nice to talk to my mom yesterday and I would encourage you all to get to know your moms and continue to grow that special relationship always. I hope that you all have a great week and thanks for all the support help and love that you send this way! I love you all and will talk to you guys soon! This week went by super fast and I can’t believe it is already Monday again! I hope that the week went really well for all you guys and that you all enjoyed everything that life has to offer. Thursday went by well for transfer days and everything got figured out just fine. I was able to send off Anziano Borner on the train up to Rome and Anziano Nessen got off the same train. We were able to say goodbye to everyone that Anziano Borner had the opportunity to work with down here and that went really well! We were able to see a good number of people and were able to have some really cool lessons with them as well. We were able to do some good work and we really hope to be able to continue to increase all the work that we have going on here in Cosenza. We are really looking forward to seeing all the things that we will be able to do here with what we have and all that we hope to gain. I am so excited for this transfer and so excited to be working with Anziano Nessen. He is so funny and he just keeps everything so fun. We are going to have a lot of fun together, and be able to get a lot of work done as well. We are super pumped for everything that we have. This week will be really important in finding new investigators and making sure that we can really help them get to where they need to go. We really hope to do a lot this week and pray and expect the miracles. It is cool to feel the energy here and in the whole mission right now and how we are all working together to reach 40 baptisms in one month. We are really pushing for this hard right now and really want to be able to help all those that are in the zone push together. It is really fun to be here right now and be doing all these great and wonderful things with everyone. 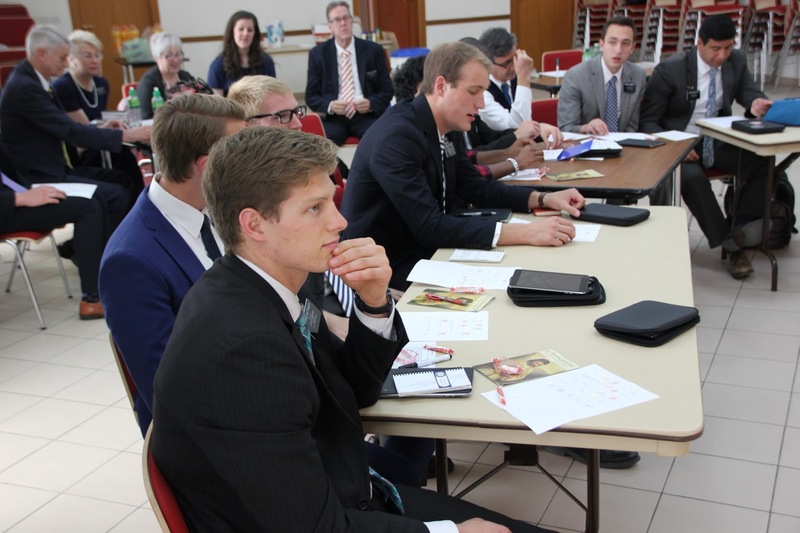 We were able to have a Missionary Leadership Council this week that went really well and helped us really see things that we can work on! We had to go down to Crotone for that and that is where Anziano Nessen started his mission so he was really excited about that! This week is Mother’s Day and I don’t have much time to write, but I really wanted to share part of this talk from the October 2015 General Conference with you all about Mothers. “Today I declare from this pulpit what has been said here before: that no love in mortality comes closer to approximating the pure love of Jesus Christ than the selfless love a devoted mother has for her child. When Isaiah, speaking messianically, wanted to convey Jehovah’s love, he invoked the image of a mother’s devotion. “Can a woman forget her sucking child?” he asks. How absurd, he implies, though not as absurd as thinking Christ will ever forget us. “This kind of resolute love “suffereth long, and is kind, … seeketh not her own, … but … beareth all things, believeth all things, hopeth all things, endureth all things.” Most encouraging of all, such fidelity “never faileth.” “For the mountains shall depart and the hills be removed,” Jehovah said, “but my kindness shall not depart from thee.” So too say our mothers. “You see, it is not only that they bear us, but they continue bearing with us. It is not only the prenatal carrying but the lifelong carrying that makes mothering such a staggering feat. Of course, there are heartbreaking exceptions, but most mothers know intuitively, instinctively that this is a sacred trust of the highest order. The weight of that realization, especially on young maternal shoulders, can be very daunting. I really love this talk and am so thankful for the divine role of mothers and the responsibility that God has given them all. I am thankful for all the sacrifices, love, charity, lessons taught, patience, examples given, and so much more that they all offer us. I love my mom and am so thankful for all that she has done for me and I know that Heavenly Father is happy with the work that she has done in raising us. I know that all you moms out there really at times carry the weight of the world on your shoulders and I just want to thank you all to for all that you do! I am so excited to talk to my family this week and can’t wait to hear from them. I have to go, but I love you all and am thankful for all the support. Talk to you again next week! Crotone District, April 2016, courtesy of Anziano Yskes’ blog. The district comprises the cities of Cosenza, Catanzaro, and Crotone. I hope that everyone is doing well and that you are all enjoying life. I am sorry that this will not be the longest email that I will be able to send this week! 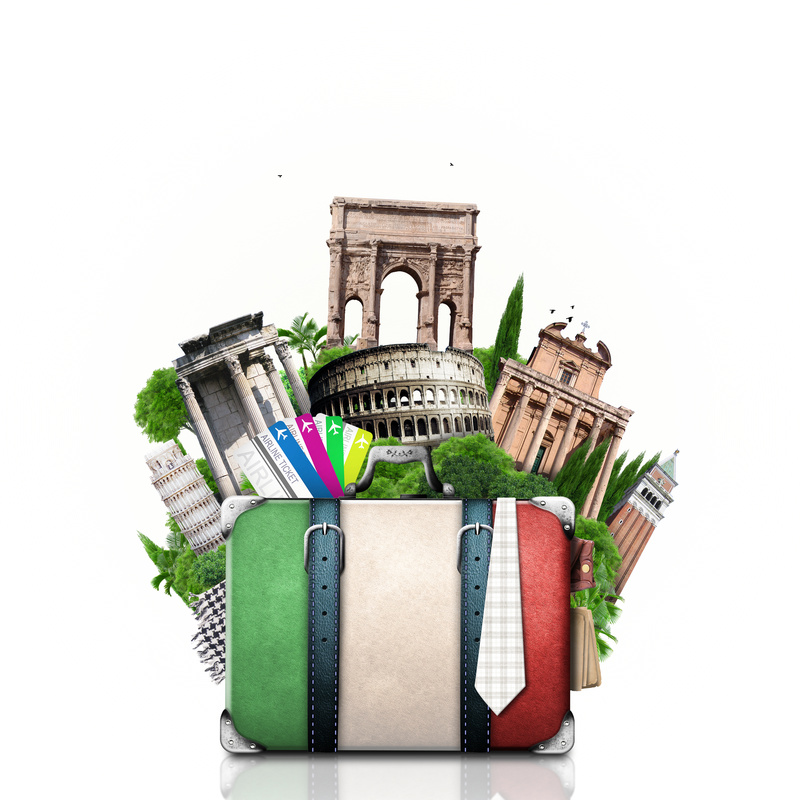 So for transfers I will be staying here and Anziano Borner will be headed to Rome 5 this Thursday. 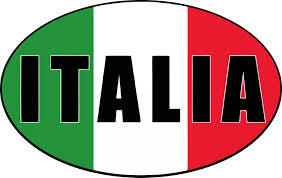 I will get Anziano Nessen who is coming up from Mistretta in Sicily. He is super awesome and we were in the same zone for 4 transfers so it will be awesome to get to work with him and know him better. Will be a lot of fun for sure. We are really looking forward to it. This week went by really well and we were able to have some lessons with people. One lesson with our investigators was really cool because at the beginning of the lesson we followed up on his Book of Mormon reading and he was able to recognize that he needs to be reading it way more. It was just cool to see that prayers for him came in a different way than we had expected. We assigned him some chapters to read and we really hope that he will be able to read them and we will be able to really teach according to his needs and what will help him find the truthfulness of our message on his own. We can’t give it to him, he has to search it out himself. 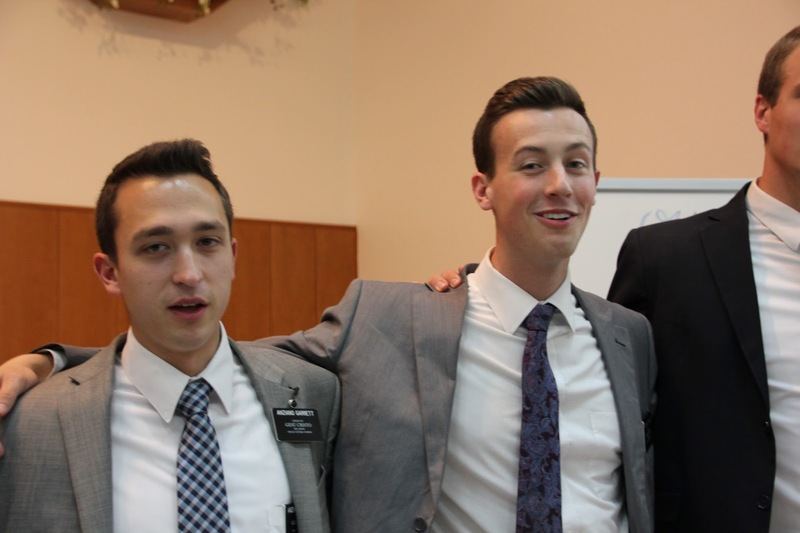 We got a referral this week that sounds really awesome and we strangely got the call from the St. George Utah Temple visitors center from the sister there, which is generally not allowed I don’t think, but she was from Italy and gave us the referral and we were able to go out and contact it and we will be setting up a lesson with him and his friend this week, so we are super stoked about that too! He knows some members as well which will be super nice to be able to get them to help with lessons when they are available. We had two other really spiritually powerful lessons this week. One was with a new convert that was about fatherhood, based on Elder Christofferson’s talk from last conference, and it went super well. 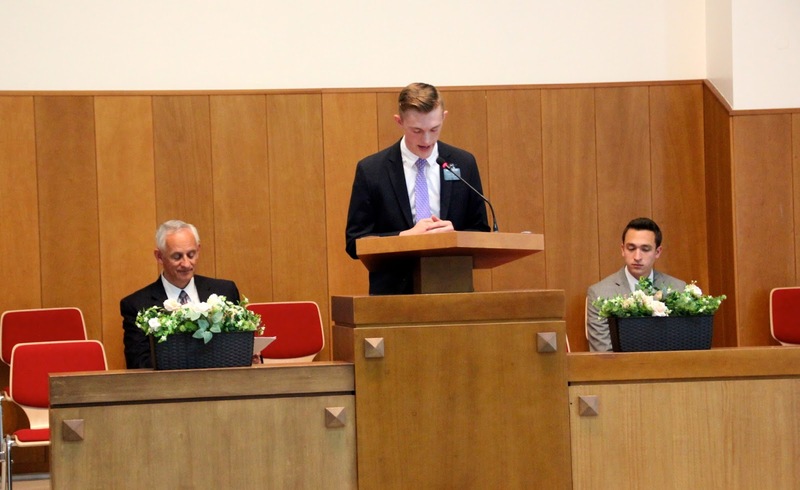 It was awesome to hear his testimony and the responsibility he knows that he has as a father. It was so cool and he is such a strong guy with an amazing faith and their family is super awesome. They have really cute kids. The other was with our Branch President who is recovering from a heart attack. It was super cool to go visit him and he really enjoyed having us over and we were able to share a nice short message with him. Glad that he is doing better and he should be back home in a few weeks or so. Thank you guys so much for all the support from back home and all the prayers that you guys offer for me. I am very thankful to know that we have all the support that we do. I love you all and hope that you all have a wonderful week and that you will all be able to enjoy it as fully as you can! From Sorella Carver’s blog: “Most intense game of Jenga I’ve ever played! 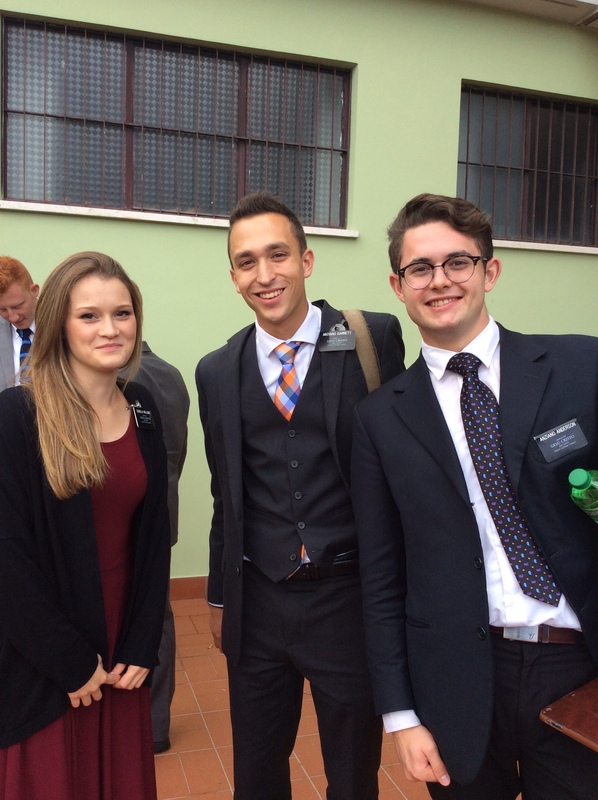 – Sorella Pinnegar, Anziano Garrett, and Luka.” Cosenza, April, 2016. I hope that everyone is doing well!! This week was really good and we were able to see a lot of really cool miracles throughout the week with what we had going on. I am sorry I don’t have a ton of time to write this email today. I lost a little bit of time with email this week. We weren’t able to see a ton of our investigators this week, but we were able to have a lot of good lessons and that went really well. We were street finding and this guy next to us was walking right by us so we started talking and had a really good conversation with him, but we wasn’t too interested to hear what we had to say, since he was pretty firm in the things that he believed. At the end though we asked him if he would be interested to meet so that we could just share the message with him and then leave it up to him to find out its truthfulness. He said I would but you guys would have to come to me first. So we said yes right away and were able to go to a Catholic mass this week. It went well and then we had a lesson with him a few days after. It was super cool to see that it all worked out like that. This week went really well and we were able to see a lot of really cool miracles throughout the week, big and small. We didn’t get to meet a ton with the people that we are working with right now. 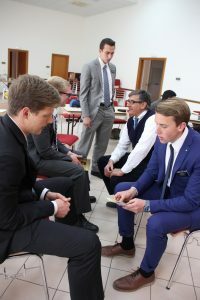 We did get to meet with one and we really have to help him read the Book of Mormon because that will be the only way that he is going to know if the Restoration of the Gospel of Jesus Christ is true or not. He is such an awesome guy and is super funny and all. He is really smart and I just hope that he will really continue to strive to read the Book of Mormon each and everyday. It will truly make all the difference. Anziano Borner and I started running last week and we have been going out every day, so that has been super nice and we have really enjoyed it a lot. We feel really good throughout the week and it is just super nice to be able to get back into the running mode and everything. I have really missed it. I feel out of shape, but nothing terrible, thank goodness. The runs are super pretty here though and super fun. We like running towards centro storico. They are also super hilly! We did a solid mile up a hill during the week so we were really tired after that. It was super cool though and was a really pretty view. It has been fun though! Our goal is to run out to McDonalds, eat breakfast, and run back by the end of the transfer. We plan on doing it the next Saturday after this one hahaha. So this week during English course we have been able to get a lot of new students and there is this one younger couple that are super cool. They are super fun and we really love having them here. We hit it off at the end of the class when the guy and I were talking about music for just a second. We were able to get their number the second lesson and they are totally down to meet!! We are really excited to see how it will turn out and what will come of it! I really hope all goes well! They have a 3 year old son too!! So awesome! Another miracle that we were able to see was when we were doing finding on the main drag of centro. There were a ton of people out and we were trying to stop so many, and not a single one stopped to watch the video the whole time. We turned off the road and the first or second person we stopped watched the video and we were able to set an appointment right there with them. The lesson was last night and it went really well and they are so nice. We only did it with the grandma but there is a whole family that lives here so we really hope that all goes well and we will be able to teach the whole family about the gospel! We were super excited about it for sure though! 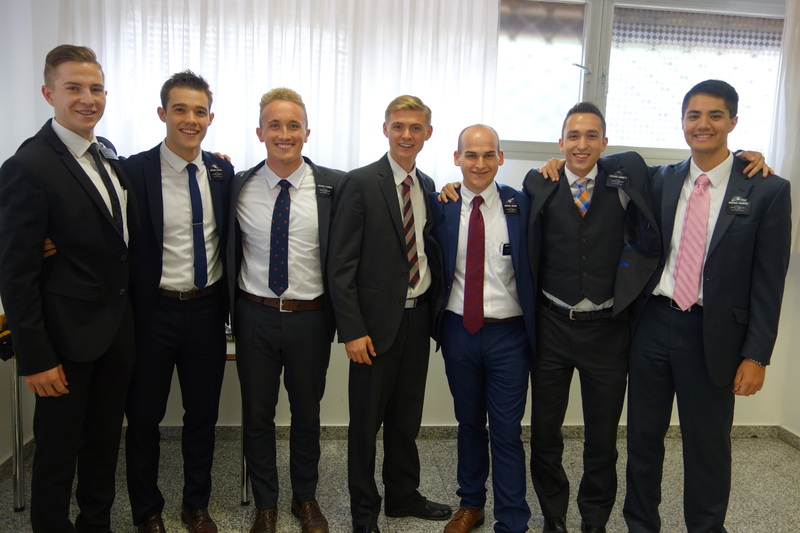 We were able to go up to a small town called Saracena this week where we have some members. It was a really good visit with them and it went really well! We also found this store that sells candy from America and the UK so that was pretty cool! We bought a few things that, of course, we probably didn’t need, but it was nice to have some more candy from back home! Saracena was a really cool city and the members are so nice. They don’t get a ton of visits so it was nice to get up there and see them!